BEIJING -- General Motors CEO Dan Akerson won't rule out closing factories as he restructures GM's loss-making Opel unit and said it will be "a while" before Opel turns a profit. Describing the carmaker's European operations as a "four-alarm fire," Akerson declined to comment when asked if he would have to shutter plants. He cited ongoing union negotiations over restructuring options. But Akerson said Germany-based Opel won't recover until excess production capacity is balanced with shrinking light-vehicle demand across Europe. "Until capacity or production is matched with demand, we're not going to be in a very enviable position," Akerson said in a keynote address Tuesday at the Automotive News China Conference. "Unless you have a strong export model in Europe, you're not making money," he said. 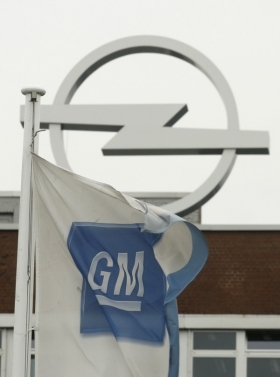 Akerson added it would be "a while" before GM's European unit returns to profitability. But he declined to give a specific timeline. GM posted losses of $747 million in Europe last year and has racked up more than $14 billion in red ink across the region since 1999, despite repeated turnaround steps. The automaker, on average, lost $630 on each car and light truck built in Europe in 2011, compared with profits of $2,460-per-model in North America. Demand for light vehicles is falling in Europe as government austerity measures take hold and discourage consumer spending. The European auto market is forecast to shrink between 3 and 5 percent this year. In Western Europe, sales have fallen 14 percent since 2007, saddling the region with an excess supply of auto factories. Opel, the centerpiece of GM's struggling European operations, has suffered from rising costs and weak sales. GM shuttered a plant in Antwerp, Belgium, and cut about 8,300 jobs across Europe during the 2008-2009 financial crisis. Under its bankruptcy restructuring, GM also came close to unloading Opel in 2009, but several senior executives and directors, citing Opel's engineering and product development expertise, persuaded the GM board to cancel the planned sale. In recent months, Akerson has dispatched GM Vice Chairman Steve Girsky and global product development chief Mary Barra to help accelerate Opel's restructuring. Akerson said GM's recent alliance with French carmaker PSA Peugeot Citroen is geared toward streamlining European and other overseas operations by leveraging scale. GM is also very interested in PSA's diesel engine technology, and that is one area of possible collaboration, he said. "Are we going to look at everything from Asia to Latin America? Yes," Akerson said. "Then we would step through various opportunities which are logistics, purchasing, potentially financing in Europe."